If you are looking for a highly individualized training program for one individual or for a small group, a conflict management coaching workshop is the perfect solution. If key individuals in your organization are experiencing problems in effectively dealing with conflict, they need the focused training and coaching our workshops provide. If you or an individual on your staff needs conflict management training, public seminars are always available. However, if you really want to bring about lasting change, a one-on-one coaching workshop is far more effective. We include DISC assessments as an integral part of every conflict management coaching workshop. The assessments are highly accurate and with each assessment the workshop participant receives a 20-page personal profile outlining her/his behavioral and communication style. The DISC model outlines four primary styles: Dominance, Influence, Support and Compliance. In the workshop, we use the terminology of DISC to explain the various ways in which people of different styles deal with conflict. Participants gain a better understanding of themselves and the people they work with, and through this understanding, we coach them in new ways of managing and resolving day-to-day conflicts. Please visit the Coaching page on our DISC Training Workshops website for more information. Prior to the workshop, Roger Reece will conduct a telephone interview with the participant and with anyone else who can provide input (supervisor, direct reports, co-workers, etc.). The coaching workshop participant also completes a DISC assessment. If she/he is a manager, direct reports complete DISC assessments as well, for use during the workshop. The one-on-one coaching workshop, typically a full day, is an intensive session that focuses on the individual's conflict style and on specific situations & working relationships that need focused attention. The workshop is an accelerated training program, covering the key areas of conflict management and conflict resolution that the individual participant needs to learn. 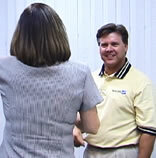 Roger Reece provides situational coaching for the specific workplace conflicts the participant is experiencing. For example, a manager may have problems with anger and aggressive outbursts in dealing with employees. An executive may need to be more assertive and proactive in confronting direct reports. A key employee may need new strategies for dealing with angry customers. These difficult situations are never dealt with directly in public seminars. Our one-on-one coaching workshops provide new insights and tools the participant can use to bring about real, lasting behavioral changes. If you are considering conflict management training for a small group, you typically have two options: send them to a generic public seminar or schedule a private in-house training workshop. We offer you a third option: an in-house coaching workshop. Our small-group coaching workshops provide all the benefits of a customized in-house workshop, with the added benefit of individualized attention and situational coaching. Prior to the workshop, we do our homework. Roger Reece conducts telephone interviews and all participants complete DISC assessments. We create role-play scenarios based on the conflict situations the group is experiencing, and we develop a customized workbook including tools and exercises to be used during and after your workshop. If your group is too large for a conflict management coaching workshop, plan two-day event. Schedule a full-day workshop on the first day and coaching sessions for key individuals on the second day. Those key individuals may be managers, supervisors, key employees or individuals who need additional help with their conflict management style. Since the training will take place during the workshop on day one, the second-day coaching sessions can be focused on the specific needs of individuals. Alternately, you can include employees, managers and supervisors in the day-one training workshop, and involve strictly managers and supervisors in a day-two coaching workshop. The second day would focus specifically on the manager's role in resolving conflict, and would include coaching for each manager. Contact us for more options and information about how we can design the perfect workshop for your group. 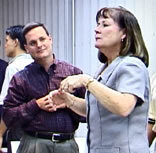 The workshop includes focused training in the principles and techniques of conflict management, mediation and conflict resolution. Roger Reece facilitates frank discussions about specific past and current conflict situations and provides direct coaching for the participants. 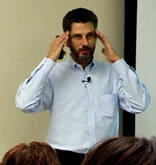 Our workshops are fun, fast-paced and focused on the absolute necessity for personal behavioral change. Are Conflict Management Coaching Workshops Expensive? The answer depends on your perspective. When your managers, supervisors and key employees are unskilled in the way they deal with conflict, the cost is extremely high. The result is high turnover, lost customers, low morale and reduced productivity. And if you apply an ineffective solution because of its low cost, your money is wasted. So how much does it cost? Contact us today and we will send you an email with our full range of fees, along with more details on the options we can provide. A conflict management coaching workshop may be the best investment you will make in improving productivity in your organization. Effective conflict management is a critically important career-development skill for managers and key employees in any organization. You may have excellent technical, financial and job-related skills, but if you're not a good conflict manager, you may have difficulties in advancing beyond your current level. Managers and executives must have the ability to motivate people, build teams and work with key external and internal customers. When you find yourself in the middle of interpersonal conflict, what do you do? What are the results? Do your conflicts result in stronger relationships or do you find it difficult to achieve win-win results? You may be at the point in your career where a conflict management coaching workshop is the best career-management move you can make. If you have one or more direct reports who are conflict management challenged, do them a favor. 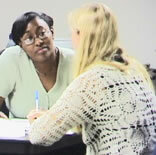 Enroll them in a coaching workshop as a career-development step. The whole organization will benefit as a result. Who Has Time for a Conflict Management Coaching Workshop? We're all busy, and when you take a day out of your schedule for training, all your work gets backed up. On the other hand, if conflict management is important, it's worth making it a priority. Contact us today to get a coaching workshop on your calendar.